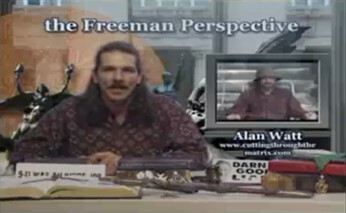 Cutting Through the Matrix with Alan Watt - Alan Watt as Guest on "The Freeman Perspective"
Alan Watt on "The Freeman Perspective"
Freemasonry, Religion of World - Bureaucrats - Skull and Bones - Perks for Lower Masons - Albert Pike, Albert Mackey - Rosicrucians. Levels, Grades, Degrees - Noble Orders, Old Aristocracy, Knighting, Sirs - Terminology of Architecture and Building - "Building the Temple" - Knights Templars. United States, Founding Fathers, British Crown, Royal Charters - Masonic Lodge Meeting, Constitution, Benjamin Franklin, France. Foundations under Cloak of Charity - Political Group and NGO funding - Demands for Laws to be Passed - Soviet Union. Chemtrails - Aerial Spraying of Prozac, Valium - Weather Modification - Tranquilizing Public - "Brave New World". Hollywood (Holy Wood, Grove) - Giving You Your Thoughts - Subliminals - Royal Institute for International Affairs, Council on Foreign Relations. Worldwide HAARP - Earthquake, Tornado, Drought, Famine, Tsunami Creation. Mystery Religions, "Societies with Secrets" - Masonic Obelisks across U.S.-Canada Border. Hermaphroditic Symbol - Perfection of Human Being - Cessation of All Conflict - Perfected Worker Breed, Ideal Design, Purpose-Made Humans. Dictatorships - Scientific Indoctrination, Bertrand Russell, Experimental Schools - "Contaminated Ideas" - Kindergarten. Total War - British Military Academies, Hitler's Army - Mercenaries, Armies - Carroll Quigley. Project for a New American Century, Wolfowitz - War in Middle East - John Stewart Mill - Peoples, Races to be Eliminated - H.G. Wells.